A disciplined proactive command and deployment system can be used to reduce time-lag delays in high-rise firefighting operations. It requires pre-planning and pre-determination of how reconnaissance can be deployed effectively and rapidly on arrival to (a) locate the fire; (b) control the primary risk zone and (c) establish a Forward Command role at the Bridgehead. The Lobby Commander will be the senior fire officer on an initial two engine attendance that arrives together or closely within a minute of each other. Where the second engine is delayed, the first officer on scene should undertake the Forward Fire Commander’s role and form part of the initial Reconnaissance Team, establishing control of the fire lifts and reporting to a relatively ‘safe’ floor at least 3-5 floors below the lowest reported fire floor. The second arriving officer will become the Lobby Commander and will deploy additional crew members to make up secondary support to the primary reconnaissance team. Where the Incident Commander has deployed as the Forward Fire Commander then the next arriving senior fire officer (depending on level of command) can either report to the lobby and take command of the incident, or report to the Bridgehead as the S&R Commander. The S&R Commander (based at Forward Fire Command) should be deployed to deal with the deployment of search and rescue teams above the Bridgehead, based on the priority triaging of occupant assistance calls received. A high level of communication and coordination is needed here. Fire in a tower block under construction, Jumeirah Lake area, Dubai January 2010. The author’s research in the city of Kuala Lumpur in 2008, a city encompassing over 450 tall buildings, demonstrated how a proactive response can reduce intervention times. The standard approach there to high-rise firefighting was, as in most places, based upon a ‘reactive response’ incident command system. The author’s research prompted a change to a ‘proactive’ system of incident command and response and this enabled a reduction in response and deployment times by at least four minutes (water on the fire) (Figure One). Figure One: Reactive timings (upper) versus Proactive timings (lower) achieved by the two response and deployment strategies implemented in the same building, before and after training. The Proactive ICS also enabled careful management of staffing deployments to ensure the fire attack remained uninterrupted and supported. In this trial, the Proactive ICS plan established a Bridgehead (Forward Command post) within eight minutes on level 18 and enabled water to be applied on the fire within eleven minutes, following arrival on-scene. A secondary support hose-line was never achieved within time-scale under the ‘reactive’ approach. The most glaring issue was the inability to maintain a constant attack on the fire, under the ‘reactive’ approach, due to insufficient staffing at the fire floor. As firefighters are generally exposed to high heat build-up as fire develops between the concrete floor slabs their time at the fire is often reduced to 10-15 minutes. This means relief crews should be ready for deployment from the Bridgehead (Forward Command) to arrive on the fire floor and at the nozzle ahead of time. This is a critical point that is often forgotten and failure to do this often allows the fire to develop rapidly beyond control. 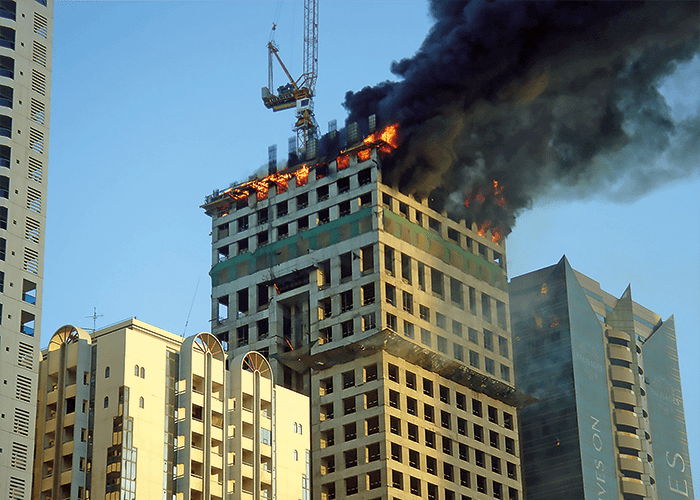 Two recent office tower fires in London and Madrid have seen ‘first response’ firefighters incapacitated by rapidly developing fires between the concrete floor slabs as they were exposed to high heat conditions on the fire floor for just ten minutes. This required second and third waves of firefighters to involve in their rescue rather than firefighting, causing the fires to burn beyond any immediate control. In order to establish an optimum response and intervention model for high-rise tower fires it is important to analyse and prioritise the command roles and tactical objectives that are achievable according to the weight of attack in a staffing and command perspective. It is also important to assess the risk profile according to any particular building’s occupancy, life risk, fire load and inbuilt fire protection features. Proactive command and response means pre-planning the Standard Operating Procedure (SOP) or Tactical Plan, in advance of arriving on-scene. It’s about an immediate deployment of a reconnaissance team with equipment using a Rapid Ascent Team (RAT) approach. 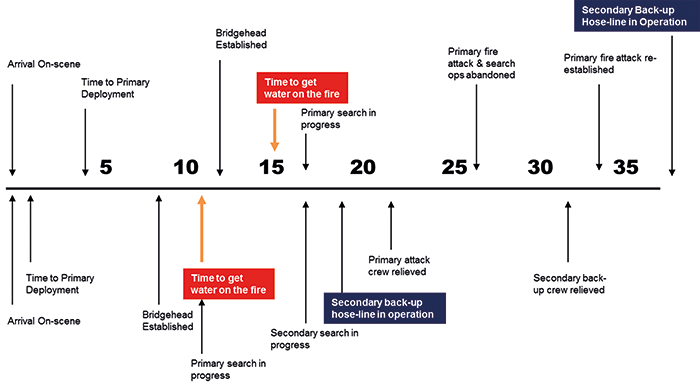 It’s about locating the fire quickly, taking immediate actions that might contain fire spread (like closing a door if safe to do so), and setting up the Forward Command Bridgehead reading for ongoing operations. Getting adequate staffing into place at the bridgehead to allow for a three team-cycle relief to each hose-line operating is also important (one crew on the nozzle, one crew next in on the nozzle and one crew in rehabilitation before a second entry is allowed). So for each hose-line in operation a minimum of 6-12 firefighters are required in the 3-cycle relief. 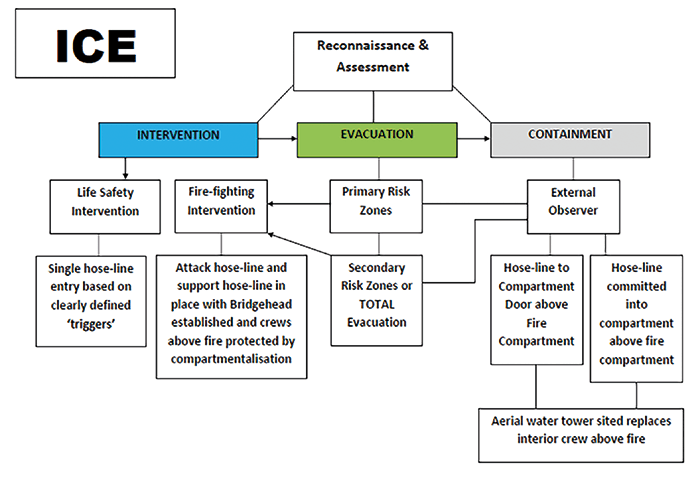 Figure Two: Primary response tactical decision making on the fire floor (ICE) – Choose the optimum solution first after any immediate rescue considerations, based on internal and external conditions and occupants who may be at risk in the primary risk zone (hallways, corridors and possibly un-protected stairways). Intervention means an immediate hose-line (or aerial water tower) is placed as part of a life safety function to stop a fire spreading beyond control. This might occur in an open-plan office area where we literally have a few short minutes to ensure adequate firefighting water reaches the fire before the involved fire load becomes too big to handle or spreads vertically. This will start to occur as the fire spreads beyond 200 square metres of floor area. A containment action might include surrounding the fire with hose-lines or aerial water towers, to prevent lateral and vertical fire spread. It may also involve closing doors and controlling ventilation flow paths to and from the fire. An external fire behaviour observer can be located at a safe point to observe and communicate warning signs of exterior window failures, smoke and fire conditions, fire spread to upper floors as well as how the wind might be impacting on the fire itself. This information is critical to any decisions on the fire floor, prioritising intervention ahead of evacuation or containment. Evacuation of immediate (primary – near the fire) or secondary (further way) zones are of immediate concern. Prior to opening a door to the fire zone, might it be more beneficial to oversee an evacuation from the primary zone that could be compromised by smoke and heat escaping into an escape corridor(primary) or stairway (secondary), for example. In some cases it might be more beneficial to ‘defend’ occupants in place. However, uncontrolled movements of occupants in areas at risk can easily lead to serious injuries or even death. Unconscious occupants are sometimes found in escape routes after the fire has been extinguished, where firefighters failed to place evacuation ahead of a firefighting intervention. The most recent research undertaken by the author involved investigation into the quantities of firefighting water required to effectively extinguish building fires. This work involved some detailed analysis of over 5,400 UK building fires occurring from 2009 – 2012. At each fire, water was flowed and breathing apparatus was worn. Figure Three: Research graph based on 5,401 building fires in the UK, from 2009-2012 where water was flowed and firefighters wore breathing apparatus. 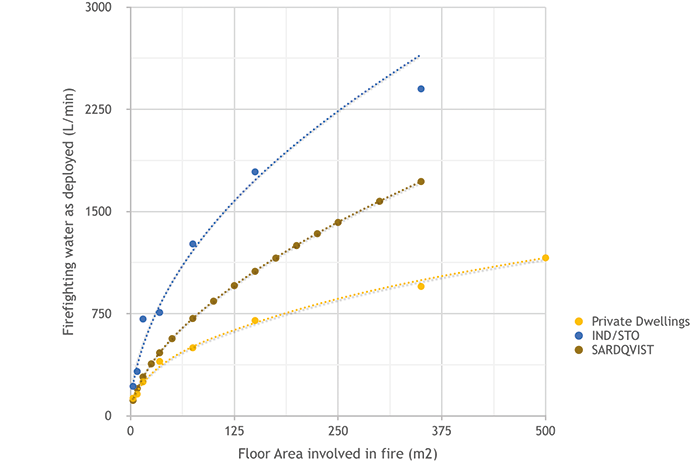 The data demonstrates a series of curves for dwelling, industrial/storage, and all other fires (based on the midline), that show optimum flow-rates in accordance with average fire loading and floor area. To fall below these flow-rates may expose firefighters to longer duration fires that will require additional resources and staffing. The research with Glasgow Caledonian University demonstrated the optimum, minimum and critical rates of flow (Litres/minute/m2 floor area) before excessive fire damage occurs and firefighters are exposed to increasing levels of heat. Critical flow-rates, below which a developing fire is unlikely to be controlled. Minimum flow-rates where suppression is achievable but firefighters face severe and punishing conditions. Optimum (adequate) flow-rates where control of the fire is achievable without unnecessary punishment to firefighters. The following graph shows where the flow-rate is optimised (as used by firefighters) against various occupancies according to compartment size and fire load. The quantity in flow required in dwellings is far less than in industrial or storage buildings per square metre of fire involvement and all other occupancies, such as offices, hotels, retail and schools, flow somewhere around the midline (validated through research by Stefan Sardqvist). To fall below these ‘optimum’ flow-rates will expose firefighters to greater risk by extending the time to extinguishment, also leading to greater levels of fire damage within the building. Paul Grimwood is in his 45th year of service in the UK and is currently the Principal Fire Protection Engineer at Kent Fire and Rescue Service. Following operational service with London Fire Brigade, Merseyside FRS, West Midlands FRS and a six month detachment to the New York City Fire Department in 1976, Paul obtained his PhD in Fire Engineering at Glasgow Caledonian University this year. His research into the amounts of firefighting water required to optimise structural fire attack has since formed part of the BS 7974 (5) suite of UK fire engineering guidance documents and National Operational Guidance (NOG) package.